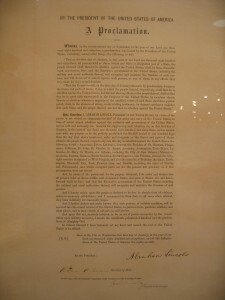 The original handwritten copy of the Emancipation Proclamation, the executive order freeing all slaves in the rebel states issued by President Lincoln in 1863, is in the National Archives, but some printed copies signed by Lincoln and Secretary of State William Seward were made the next year for public sale. Forty-eight of these copies were printed in 1864 and sold for 10 dollars each to raise money for the Sanitary Commission, a forerunner of the Red Cross. Over the 150 or so years since then, half of them have disappeared. Out of the 24 remaining, 14 are in museums and other public institutions, and 10 in private collections. One of them was purchased by Robert F. Kennedy in the summer of 1964, a hundred years after Lincoln and Seward autographed it for charity, for $9,500. He hung it on a wall in his 1840s mansion in McLean, Virginia. Robert Kennedy had been a vigorous enforcer of civil rights as Attorney General under his brother and Lyndon Johnson. Not only did he send U.S. Marshals to Oxford, Mississippi, to enforce the admittance of the first Black student, James Meredith, to the University of Mississippi and worked with Presidents Kennedy and Johnson to craft the landmark 1964 Civil Rights Act, but he actively worked to desegregate the executive branch of government, which had been all-white since virulent racist Woodrow Wilson had resegregated the White House while preaching about keeping the world safe for democracy. Princeton journalism professor Evan Thomas, a historian, said he wasn’t surprised that RFK would want to own such an important document. 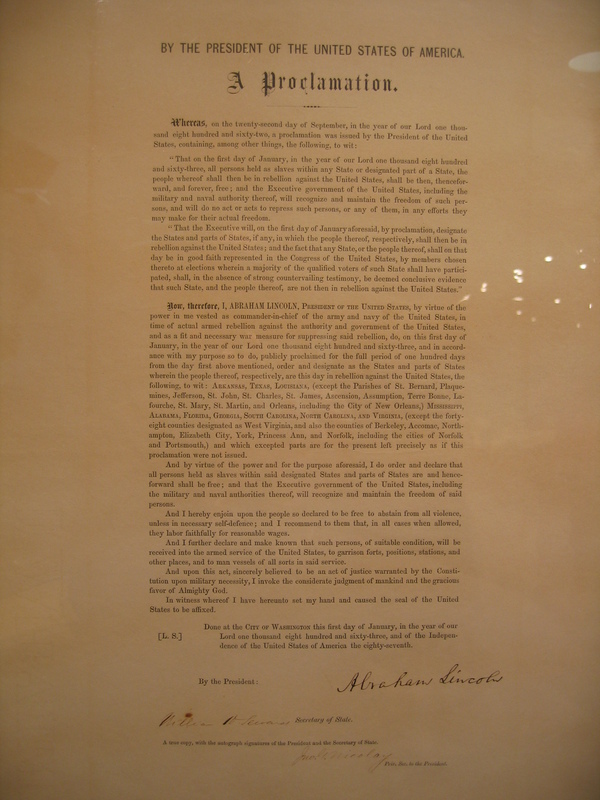 The McLean house was sold last year, and now Ethel Kennedy, RFK’s widow, is putting the Emancipation Proclamation copy up for auction at Sotheby’s New York on December 10th for an estimated sale price of $1.5 million. Sotheby’s will exhibit the document in Boston, Philadelphia and New York before the sale. This entry was posted on Wednesday, October 6th, 2010 at 11:56 PM	and is filed under Modern(ish), Treasures. You can follow any responses to this entry through the RSS 2.0 feed. You can skip to the end and leave a response. Pinging is currently not allowed. A good article. It is interesting to note the change in attitude by various historians towards Lincoln. Some see him as the great emancipator, others take a more negative view of him. Well, I don’t know if any contemporary historians view Lincoln’s record on emancipation as unblemished. After all, he didn’t free all the slaves. Lincoln made political compromises on slavery his entire presidency. i cant wait to read this i love history. Wow! Looking at history through 21st Century glasses is giving the above comment a huge distortion. Lincoln’s ‘compromises’ were what? That America then was thoroughly racist then and only took political expedients as an effort to move the country and Congress to accepting abolition of slavery. He took what he could get politically and when Lincoln did take a stand he never backed off from it. As opposed to our current Chief Executive who shoved Affordable Health Care Act down our throats and now backs off on delivering it. The ACA is a great piece of legislation that WILL reduce the costs of health care in this country tremendously. Is it perfect? Absolutely not! Obama, like Lincoln, took what he could get, in a society full of so-called “Christians” who want nothing to do with what their hero Jesus taught: Charity for those in need. Ironically, what many people do not understand, is the way in which the healthcare industry works. The people who are covered, even if they are given a “handout,” the cheaper it will be for all, including those doing the handing-out.